(Huntsville, Alabama) January 17, 2011 – Schwarze Industries announces the promotion of Chris Crews to National Sales Manager for the S-Series sales team. Born and raised in Huntsville, Alabama, Crews actually started working with Schwarze back in the eighties delivering sweepers as a summer job while he was home from college. Enjoying the work, eventually Crews moved into demos, S-Series sales, and eventually landed in the A&M department. In 1998 Crews left Schwarze to start his own equipment dealership, CRC Solutions, then worked for other sweeper companies before signing back on with Schwarze. "Sweeping is the only thing I've ever done, in some shape, form or fashion." said Crews. "I've been on the contractor and municipal side of the industry, I'm very familiar with the customer base and their needs, and I think I can contribute a lot here at Schwarze." Crews will be charged with jumpstarting the new S-Series machines set to unveil at the upcoming National Pavement Expo in Nashville, Tenn., on February 3rd. "We've got some real innovative ideas we're excited to introduce to our customers," said Crews. "The new S-Series is going to add another dimension to what we offer. "It's really going to bring up another notch of reliability and performance for our single engine machines. And on the twin-engine machines, nobody can offer the power that Schwarze can. It's what we're known for, and that's going to continue. I think we have a strong product that's going to continue being the world leader in the parking lot division." 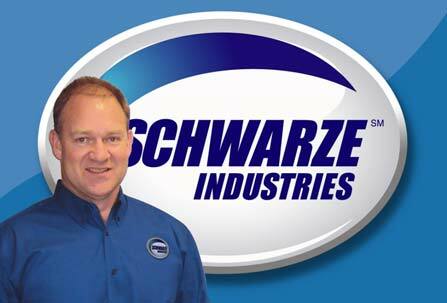 "We're excited to have Chris back," said Raymond Massey, Director of Sales and Marketing for Schwarze Industries. "He's seen the industry from a lot of different angles and has all the right experience for the position. He understands our machines and our goals and is an essential player in the promotion and development of our latest lineup of products." Since its inception more than 30 years ago, Schwarze Industries, Inc. has grown to become one of the world's largest street sweeper manufacturers and a leader in sweeping technology. Headquartered in Huntsville, Alabama, Schwarze has a workforce of more than 200 employees, manufacturing street sweepers, parking lot sweepers and road repair units. For more information on the company, visit www.schwarze.com or contact Chris Crews or Raymond Massey at 800.879.7933.